Janet L. McFarland is currently a Court Attorney Referee in Richmond County Family Court. From May 2007 until August 2017, she was a Principal Attorney at Mental Hygiene Legal Service, Appellate Division, Second Department. Prior to Mental Hygiene Legal Service, she served as an Assistant District Attorney in the Bronx County District Attorney’s Office. She graduated from Brooklyn Law School in May 2000. 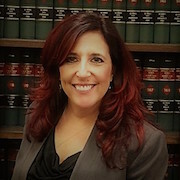 She is currently the 1st Vice President of the Staten Island Woman’s Bar Association and serves as a director on Catholic Lawyers Guild of Brooklyn and Staten Island Trial Lawyers. She is also a member of Columbian Lawyers Association of Brooklyn and the Richmond County Bar Association as well as serves on the Red Mass Committee of Staten Island. She is currently President-Elect for the Soroptomists International of Staten Island and chairs the Soroptimists’ first mentoring program for girls at Port Richmond High School. Janet is also a member of Staten Island County Kiwanis and on the advisory board of Mr. Bones and Co. Animal Rescue.